Alexander Isak's decision to join Borussia Dortmund over a host of other top European clubs highlights the extent to which the SIGNAL IDUNA PARK has become an elite breeding ground for some of the most exciting prospects in world football. Sprinkle some Dortmund stardust on your Official Fantasy Bundesliga team - head here to do so! Isak is just the latest in a string of hot young talents to hitch his wagon to the Black-and-Yellow star. The 17-year-old Sweden forward – who has already drawn comparisons with his illustrious compatriot Zlatan Ibrahimovic – completed his move to Dortmund earlier this week, signing a long-term contract. Read: Ten things you might not know about Alexander Isak. "Alexander Isak is a hugely talented striker, who many top clubs in Europe wanted to sign," enthused BVB sporting director Michael Zorc. "We are delighted that he has chosen Borussia Dortmund." Isak had caught the eye of talent scouts from across the continent after a breakout season with boyhood club AIK. As well as scoring ten goals in 24 league outings, the precocious striker made a memorable start to his international career, becoming Sweden's youngest ever goalscorer and, in the process, breaking a record that had stood since 1912. He has now joined a squad bursting with up-and-coming talent, and his move has merely served to reinforce Dortmund's reputation as a perfect petri dish for the next generation of footballing stars. The ink on Isak's contract had barely dried by the time Dortmund announced their next coup – extending the contract of USMNT winger Christian Pulisic until 2020. Downlaod the official Bundesliga app! "We are very happy to have secured the long-term commitment of another extraordinarily talented player," Zorc declared. "Christian already enjoys a high standing within the team and can become a cornerstone of our sporting future." Youth product Pulisic was promoted to the first team squad in January 2016, and has been chalking up records ever since. He became the youngest non-German to score in the Bundesliga, the youngest player ever to score two top-flight goals, and – like Isak – the youngest player to score for his national side. He has impressed with a string of assured performances for club and country. "I still have a lot to learn," the 18-year-old admits. "I feel Dortmund offers the best conditions to do that. I have the chance to play in front of over 80,000 fans. We have the best supporters in the world - it doesn't get any better than that!" What sets Dortmund apart – aside from the incredible atmosphere of the SIGNAL IDUNA PARK – is the fact that young players are genuinely given an opportunity to shine. Coach Thomas Tuchel has shown tremendous faith in his unpolished gems, regularly fielding them alongside more experienced creative talents such as Marco Reus, Mario Götze and Andre Schürrle. "We decided to go with a two-column model," Zorc explains. "Very young, highly-skilled players, but also established, internationally-experienced ones." Pulisic has featured in all but four Bundesliga games this season, grabbing two goals and four assists. Julian Weigl, at just 21 years of age, is one of Tuchel's most used outfield players. The Germany international regularly pulls the strings at the heart of midfield, with an average of 86 touches per game and a pass completion rate of over 90 per cent. Meanwhile, flying French winger Ousmane Dembele has turned Bundesliga defences inside out with his pace and trickery, attempting more dribbles than anyone else in the league and notching up four goals and seven assists. He turns 20 in May. Dembele, like Isak, was one of Europe's most highly-coveted young prospects last summer, and also turned down offers from other major clubs in order to join Dortmund. He arrived alongside promising left-back Raphael Guerreiro, fresh from victory with Portugal at UEFA EURO 2016, and diminutive Turkish international Emre Mor, a rapid and technically-gifted winger who had been plying his trade with Danish club FC Nordsjaelland. "It is not our primary goal to have the youngest squad among Europe's top teams," Zorc stresses. "But we cannot solely buy ready-made stars. We also have to develop talent, and we have proven in the past that we can offer even very young players the chance to play at the highest level." True to their word, Dortmund have regularly fielded young talents in both the Bundesliga and the UEFA Champions League this season, with generally positive results. They have certainly impressed in Europe, finishing their group ahead of defending champions Real Madrid CF, but they are somewhat off the pace in the Bundesliga. As they gear up for the Rückrunde, BVB are 12 points behind leaders FC Bayern München in fourth place. Tuchel wants them to start closing the gap as soon as possible. "We want to earn points with high-quality football," he stressed, ahead of a trip to 1. FSV Mainz 05 and a fascinating top-of-the-table tussle with RB Leipzig. "Enough for a top-three finish." The coach also admits that his young charges, talented as they are, need time to adapt to the rigorous demands of the very highest level. "We're really excited about this team," he insists, "But they are young, and sometimes they take certain things less seriously than they should." The learning curve is steep, yet there is no denying that Dortmund boast perhaps the finest collection of young talents in world football. 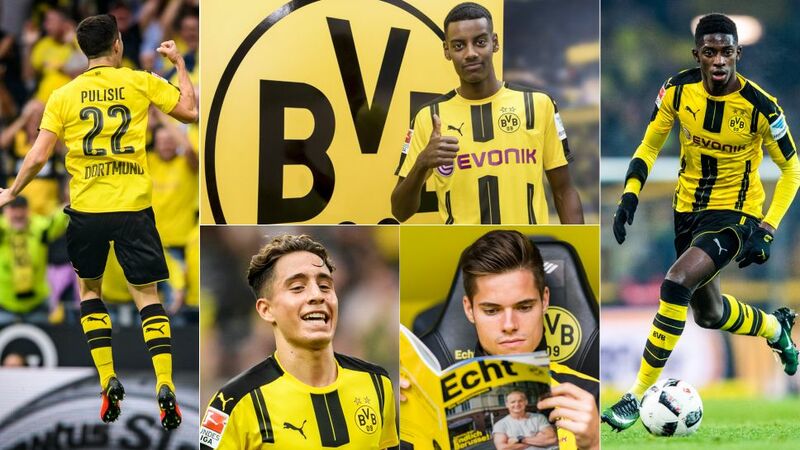 With Isak throwing his hat into the ring alongside Weigl, Dembele, Pulisic, Mor, Guerreiro and the rest, the club's future certainly looks to be in safe hands. Click here for the latest Borussia Dortmund team news!